Make your own lemonade concentrate to freeze and enjoy well after the fruit harvest. 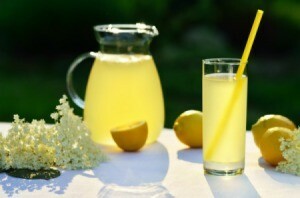 This page contains lemonade syrup recipe. This lemonade syrup already has everything but water. It's easy to take along on a trip or picnic and make as needed. In a saucepan, dissolve sugar in boiling water. Cool. Add lemon juice and peel. Mix well. Mix well - concentrate can be stored in refrigerator. Add concentrate to 5-6 cup water. We use extra sugar this time of year for lemonade as the weather warms up, but hubby likes his drinks a LOT sweeter and stronger than I prefer mine, so I make a syrup of lemon juice and sugar and keep it in a pitcher in the fridge. We each can pour a glass of water and add the lemon syrup to taste. It works very well for us.